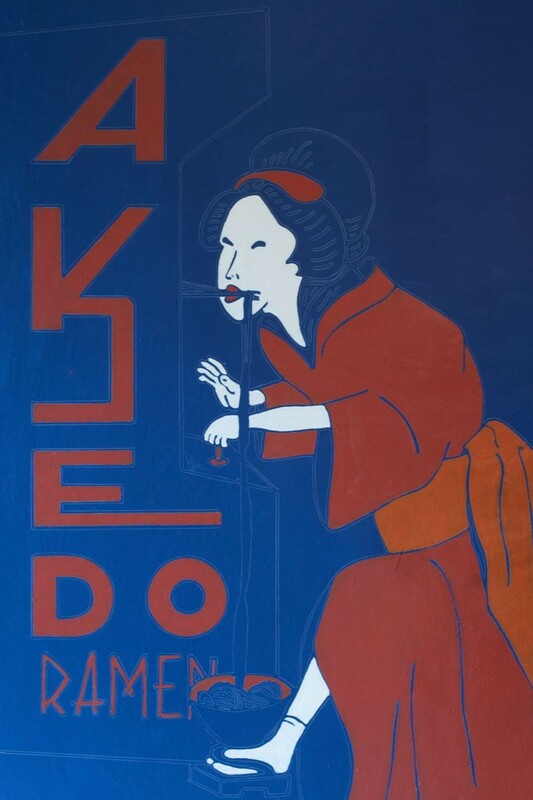 Akedo Ramen Bar is at One West Victory Drive. A BIG CITY with a small town feel is how I describe Savannah. The growth of Savannah is as steady as the shipping containers flowing in and out of our port. 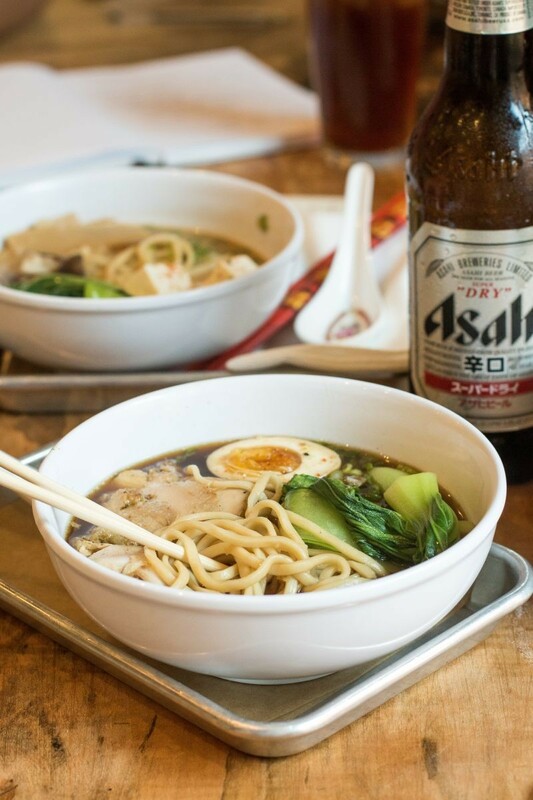 The accompanying upswing in the local food scene has brought Savannah’s first authentic ramen bar as of last week. The menu features three types of house ramen: vegan, pork, and chicken (and also the option to create your own bowl). Every broth used by the restaurant takes at least a day to make. For those of you that have never tasted ramen, it is a distant cousin to pho, but with heartier flavors and more featured ingredients. The best way to attack in order to avoid wearing the broth on your face, is to take the duck spoon that comes on the side and, using your chopsticks, you fill it up with a piece of each item floating in the broth. Once full, you dunk the spoon in the broth to gather up as much umami juice as you can. I would also recommend pairing one of the five different sakes or three different beers with your meal—as if the bowl of brothy deliciousness was not already going to warm your belly enough. 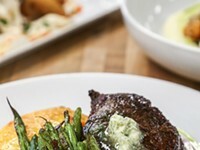 Truly any choice you make will pair perfectly as a cold accompaniment to the comforting meal. The Vegan Miso begins with the creamiest miso broth I have ever slurped up, making the broth much lighter in color than most miso broths. The bowl is layered with a heavy hand with ramen noodles, chunked tofu, bok choy, bamboo shoots, and shiitake mushrooms, each ingredient more tender than the last. 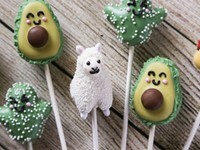 Even though this is a vegan dish, you will not miss the meat at all. The miso broth is so hearty that the texture is reminiscent of a peanut butter sauce, and the noodles are hearty as well, thick yet delicate with an umptious chew. The tofu easily dissolves on your tongue, and the roasted mushrooms add a meatiness to the dish. Finally, the bok choy brings a much needed brightness to the cozy dish. 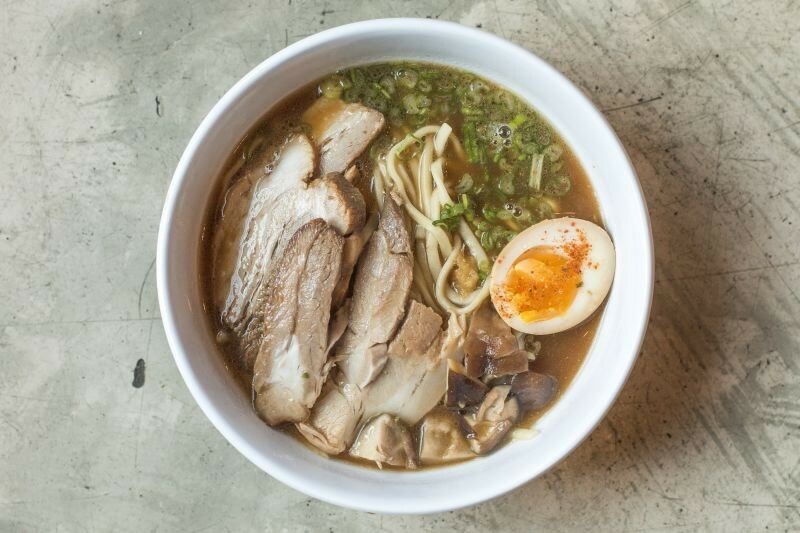 Next on the list of house bowls is the “classic ramen,” says Brad, or Pork Tonkostsu, which traditionally features ramen broth that is created using pork bones, among other things, and served with pork belly, also known as Chasu. Akedo’s version comes with all the required authentic items—a soft boiled egg, shiitake mushrooms, mayu oil, and those same hearty ramen noodles I mentioned before. This dish has a bit more kick, which is surely welcome with Asian cuisine, and overall tastes deeply of umami with a subdue flavor of salt. The shiitake mushrooms bring earthiness to the bowl, and the drizzle of mayu oil and black garlic oil add a hint of smoky garlic flavor. Chicken Soyu is the third and final house bowl. Soyu stands for the Soyu (or soy) broth that could be considered the leading lady in this dish. The star itself, the ultra-tender chicken that would taste just as delicious on its own. Paired with the deeply savory soy broth and delicate bird is shiitake, ramen noodles, bok choy, and an egg. The Build Your Own features many items that are not included in the three house bowls. My favorite, the kimchi made by the Chefs at Akedo, is for those who truly feel as though they are setting out to create their own masterpiece. Be careful though — there are so many choices it would be easy to over-select. The Chicken Soyu house bowl. In addition to the house-made ramen noodles, the restaurant also offers Udon and Vermicelli noodles. Vermicelli is for those who prefer skinnier noodles, as compared to the robust traditional udon or ramen options. Power ups, or add-ins, are available in personalizing your soul warming bowl. Togarashi, a Japanese red chili pepper blend, is perfect for spice lovers. Similar is the chili bomb power up, a paste made with a blend of chilis is still a fiery choice but with a bit more citrus and salt added in. Another bomb is the umami power up, which is a concentrate hit of six flavors of food. For those a little less daring, and maybe more traditional, Wakame may be more your style; it is a sweet edible seaweed. Similar to wakame is the option to add nori to your bowl. Most people have tasted this edible seaweed strip when eating sushi. Let’s not forget the bamboo shoots, leek hay, and green onion; all bright and earthy punches to consider as additions to your meal. For the extra hungry, you can also double your protein, which is a great option considering how quickly you will inhale the decadent pork or chicken. As for the future, the store is only going to get cooler, and may feature actual arcade games. 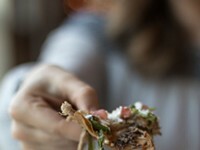 As I mentioned in my last article on the food group, a third concept is forthcoming in the space above El Coyote and Akedo.